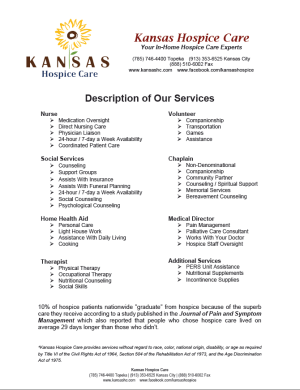 Who is Kansas Palliative & Hospice Care? 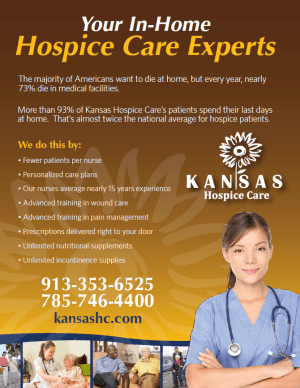 Kansas Palliative & Hospice Care is locally owned and operated. Most hospices are owned by large out of state corporations. We make decisions locally. Our people live in the community we support. 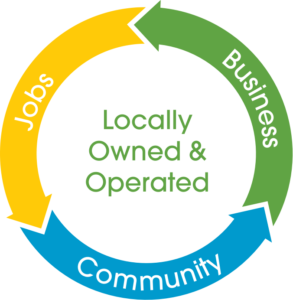 Our leaders and owners are actively involved in the business and are all local residents. 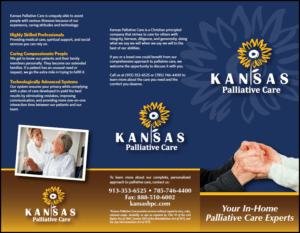 Kansas Palliative & Hospice Care is one of the oldest hospice providers in the State of Kansas with its approval to provide Medicare hospice services originating in 1991 and supporting counties throughout the Kansas City, Lawrence, and Topeka areas – see all approved servicing counties. Kansas Palliative & Hospice Care is a community based hospice care organization dedicated to hospice care and focused on meeting or exceeding our patients’ individual medical, emotional and spiritual needs, while making each remaining moment as meaningful as possible. While Medicare mandates the minimum services that hospice patients must receive, at Kansas Palliative & Hospice Care, we are committed to exceeding industry standards because we recognize that each patient’s life experiences and spiritual beliefs have created a unique individual who deserves the finest care and emotional support, while honoring and respecting their needs and wishes. What Makes Kansas Palliative & Hospice Care Unique? The Kansas Palliative & Hospice Care team are experts in taking care of seniors in the home. Most hospice service providers prefer to take care of hospice patients in facilities such as assisted living facilities, nursing homes, hospitals or in-patient facilities. The majority of Americans want to pass at home, but every year, nearly 73% pass in medical facilities. More than 93% of Kansas Palliative & Hospice Care patients spend their last days at home. That is nearly twice the national average for hospice patients. 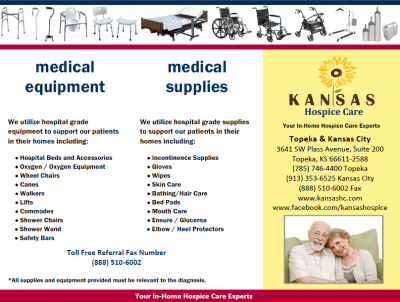 Kansas Palliative & Hospice Care provides most equipment and supplies related to the hospice diagnosis at no charge. Equipment and supplies are expensive so many patients are unable to afford these much needed services. 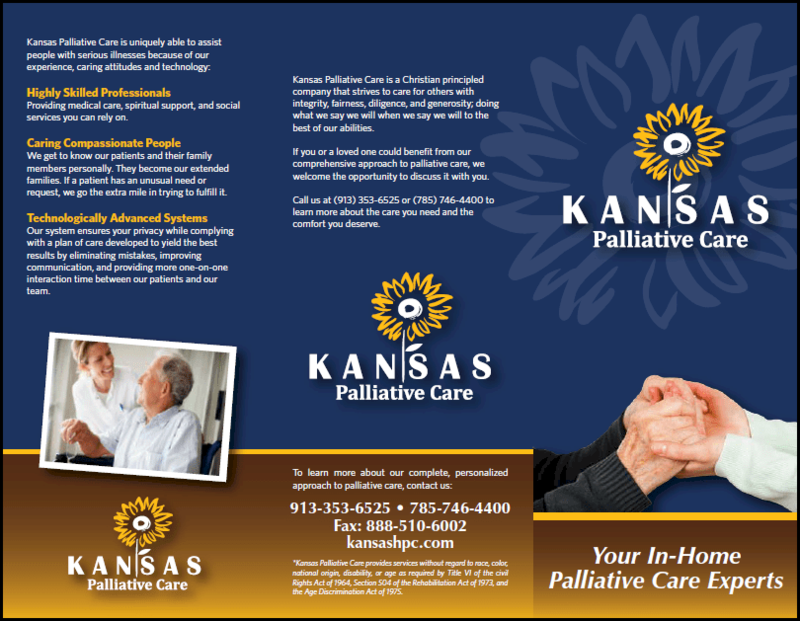 To learn more about Kansas Palliative & Hospice Care please review our company brochure (below) or contact any of our staff or submit a question online. Call us today to learn the many benefits of the Medicare Hospice Benefit and the difference in care you will receive with Kansas Palliative & Hospice Care! **Kansas Palliative & Hospice Care provides services without regard to race, color, national origin, disability, or age as required by Title VI of the Civil Rights Act of 1964, Section 504 of the Rehabilitation Act of 1973, and the Age Discrimination Act of 1975.